Tri-Chamber Networking Event - SOLD OUT! Name: Tri-Chamber Networking Event - SOLD OUT! Three local chambers are uniting to bring you one big networking event. 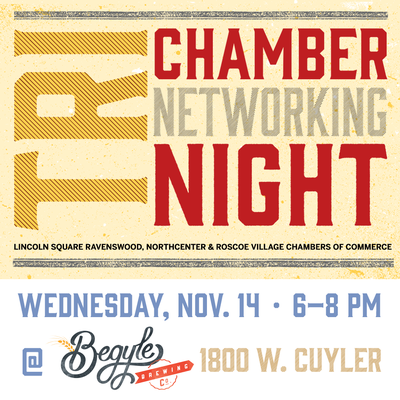 Don't miss your chance to attend this special networking event with the membership of three unique Northside chambers: Northcenter, Roscoe Village and Lincoln Square Ravenswood. We're teaming up to bring you an invaluable opportunity to meet other area businesses. Please join us on Wednesday, November 14th at Begyle Brewery for some locally brewed beer, small bites, and networking with fellow local business representatives.